"Don't be the Object,'' was the mantra on Saturday evening, 27th Feb 2016, at the Puttenahalli Lake gazebo. After a fun theatre game, the 25 children were divided into groups of 5 and an exercise to sharpen the auditory senses, harmonize voice and improve awareness, movement and spontaneity was conducted. By now, the kids were all ready for the real thing! 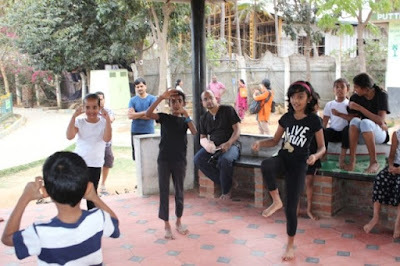 Murali Krishna, the super talented mime artist from ASMI, an institute of art, culture and theatre, introduced the children to mime, which is an art of silent recreation. In this art form, facial expressions, gestures and postures do all the talking. The very first mime enactment was peeling an imaginary banana and eating it. After this, the highly interactive session encompassed different activities, actions and scenes....how to ask and tell the time of day, cricket batting, lifting a heavy rock, switching on the TV with a remote control, opening the refrigerator and drinking from a bottle, riding a motorbike, etc. 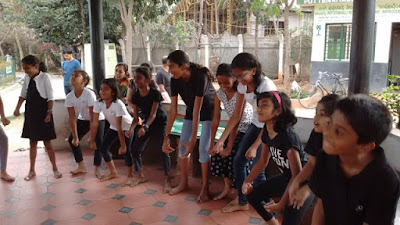 In between all this, the groups were given several topics such as, a scene from a Zoo, a wedding photograph and finding a treasure, to enact using the mime techniques that were taught. The groups with children ranging from age 7 to 12, huddled together and then came up with extremely creative and interesting ways to mime these concepts. All the time, the children remembered to 'not be the object'. After each enactment, there was animated interpretations and discussions. 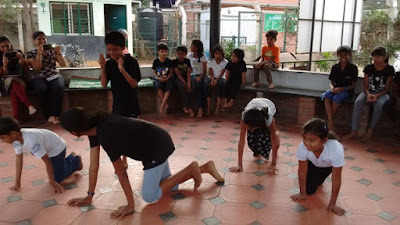 The children lost their inhibitions and found a way to express themselves in a manner much different to the one they are normally accustomed to. Puttenahalli Lake once again resounded with the laughter of happy children and proud parents, that evening. The day when I went to Mime Workshop, I had lots of fun. I enjoyed Miming that means pretending that I opened a fridge and got out a juice bottle, and opened it with a bottle opener, and drink it! Yoo Hoo! It was nice, really nice. And I learnt 3 important things in Mime. First important thing is the size of the object. Second is shape of the object and the third is the weight of the object. The main thing about Mime is "Don't become the OBJECT" . We also learnt to do a Mime walk! The walk was to walk in the same place! That was fun! To know more about ASMI, please contact Poornima <poornimaprabhakar20@gmail.com>.